As many of you know I was chosen as a Rutland Cycling Ambassador last spring and being an ambassador has given me the chance to get to know the company a lot better. 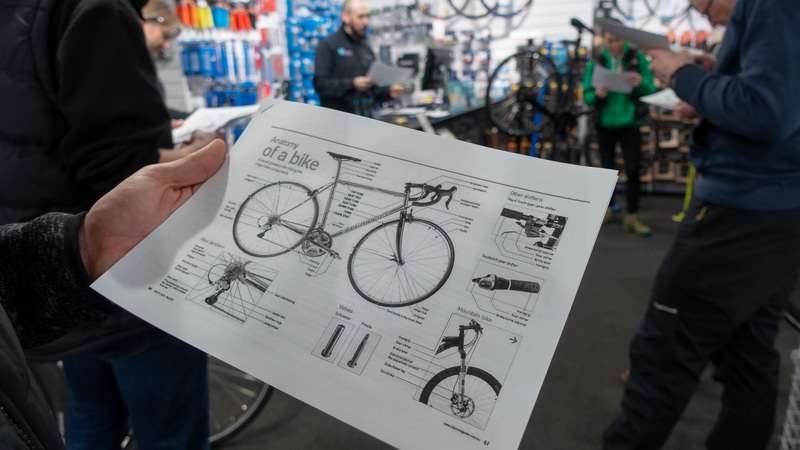 When it came time to swap the Specialized Ruby bike for my second test bike from Rutland, I decided to make the journey to the flagship store, Whitwell to see Rutland Cycling in person and meet the team in real life who I’d been messaging for months. When I went to collect my Specialized Diverge it was on an evening Rutland was having one of their maintenance courses running so I stayed around to see what they were about. They have a series of 4 maintenance courses covering things from puncture repair to wheel truing. 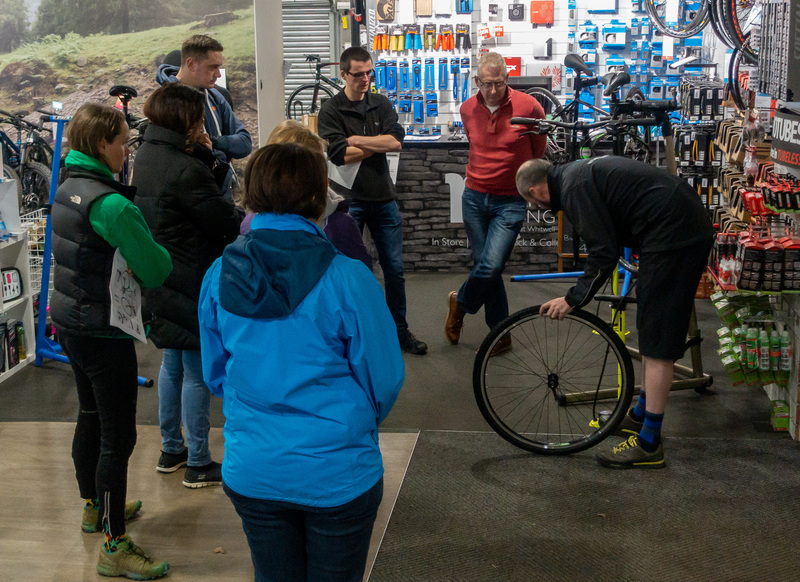 I was there for the first of the series, which included things such as how to do an M check of your bike, how to fix a puncture and know which innertube you should buy. The great thing about the course is the instructor gives a talk and then it’s hands-on time so you can try yourself, the best way to learn. Rutland has bikes on hand that you can practice on or you can use your own bike if you like. The night I attended there was a good mix of people, men and women of a variety of ages, and the instructor made sure everyone was comfortable and encouraged us to ask questions. I was impressed. I was also impressed with the language that was used, it was very clear as to what he was talking about because he didn’t use jargon and he explained when there were other names used for the same thing (like presta valve aka French Valve). The course has a fee of £5 which is less than the value of the gift you receive on the night, an item related to what that evening covers. The night I was there it was a cassette cleaner and chain lube. This makes the course truly great value. 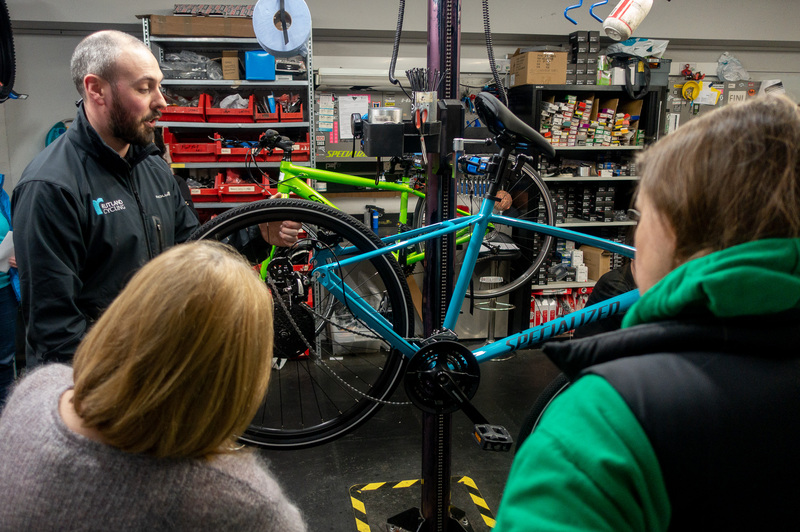 If you live near a Rutland Cycling store you’re very lucky, be sure to make the most of it and the chance to learn how to repair your own bike, you never know when it might come in handy. When I started cycling in London I never got around to taking a course because they were around £50-90 a course. Rutland Cycling is a growing company with 11 bike shops and they are currently growing and expanding at a time other bike shops in the UK seem to be struggling, like Evans Cycles who were in the news recently regarding their financial troubles. If Rutland continues to offer value to their local cycling community in ways such as offering maintenance courses, and leading local rides and supporting women riding initiatives as they have been they’ll have loyal customers for a very long time and continue to grow. If only they had a location near me so I could take the other classes! You can learn more about any upcoming classes on offer on the Rutland Cycling website. Cycling portrayed as normal, including a smartly dressed women! I then learned that Kit and Ace were Canadian (like me) and I became even more curious. I found out they’re known for their technical cashmere, an easy wearing easy to care for cashmere. The Kit and Ace range is functional, work-appropriate and it allows for movement using four-way stretch. Smart, comfortable and functional it sounded like a winning combination. I get cold easily so cashmere is one of my favourite materials I love the softness of it and the warmth to weight ratio. On my ride across Canada I took my very old (elbows worn through) cardigan to keep me warm sleeping. Sadly, over the years I’ve lost of few of my beloved cashmere sweaters to accidental washings in washing machines, an expensive mistake. Being able to have clothes with cashmere that’s machine washable would be a true luxury. I understand from my Canadian friends that Kit and Ace have been known for their eye-watering prices but they seem to have adjusted them and while not cheap the clothes are on par to what you might pay for something from Lululemon. I’ve been moving towards having fewer things, but making sure I love the things I have and that they work on and off the bike. So I don’t mind spending a bit more to get something that meet that criteria. On my trip to Canada last October I thought I’d try a couple things, because although they do ship internationally but I wanted to avoid having to deal with returns and custom fees. Upon my arrival in Canada, I had a parcel waiting at Dad’s with a bike ready autumnal outfit. Most of their clothes are cycling friendly but the Navigator trousers have few extra features that help even more, they have some water repellency and are quick drying should you get caught in the rain. I personally really like all the pockets, including a hidden one that fits a phone and a zipped one next to the normal side pocket. The only thing that would improve these pants for me is a little extra space in the thigh (hello cycling muscles) or if they were skinny trousers (my preferred style) rather than straight leg. The sweater, so comfy so soft. It has a brushed inside which I discovered makes for a great cycling top because it provides wind protection without having to put on your jacket, it’s pretty close to the Roubaix fabric you find in cycling jerseys. Did I mention how soft it is!? I’m always keen to support a company promoting cycling as a normal part of life. Not all their clothes are cut to my style preference but the pieces I do like I really like. Their technical cashmere is a great way to get more cashmere into my life without the risk of shrinking something really expensive. I’ve already bought another a dress in the Boxing Day sale and I’ll be keeping an eye out for a skinny version of the trousers for my visit to Vancouver in September when I can visit a shop in person. Cycling 197km With a Backpack!? Cycling Bib Shorts or Not? When I triggered a discussion on Twitter in November about bib shorts Velocio reached out to me to see if I would be interested in trying their solution to every women cyclist (and some men too) problem with having to undress to use the toilet when wearing cycling bib shorts. I’m always very happy when I hear about a company thinking about women’s needs when it comes to cycling and so I was keen to give their bib shorts a try. It’s been a few months and I’ve worn them inside on the trainer and out on longer rides. Watch to find out my thoughts on Velocio’s Signature Fly Bib Shorts for women. I currently have 2 bikes here in the UK and one at my Dad’s in Canada. They are all very different and serve different purposes. My Brodie Argus 1.0 is my workhorse, I use it for touring, commuting and running errands around town. I’ve spent so many happy miles on this bike, had many adventures and have properly bonded. I’m not the fastest on my Brodie (it isn’t the lightest of bikes!) but I am most confident on it. Watch to learn more about why I love this bike.